Barna GAA would like to express its deepest sympathies with the family of the late Paddy Sweeney. Paddy was a proud Killanin club member, a GAA referee for many a year and one of the most loyal and committed members of the west board gpc over the years. For the last number of years Paddy was the vice chairperson of the county football board. 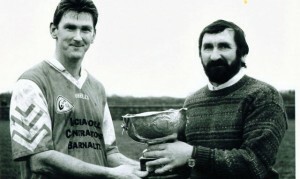 In the photo to the right you can see Paddy presenting the 1997 League Cup to Davy Carr.